At ENT Physicians, Inc., we strive to provide excellent care with leading-edge technology in all aspects of audiology and hearing aid services for our patients in Northwest Ohio. 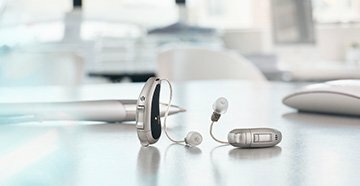 The bone-anchored hearing aid (BAHA) is a special device to help with certain types of hearing loss that cannot be treated with traditional hearing aids. The BAHA transmits sound waves to the inner ear through bone conduction and is surgically implanted behind the ear. Our knowledgeable audiologists can determine if the BAHA is right for you and assist you through the fitting process. Our expert audiologists at ENT Physicians, Inc. offer in-depth diagnostic testing for people of all ages to determine the exact nature of your hearing loss. Our team employs state-of-the-art comprehensive hearing exams with detailed results to determine whether hearing aids or medical treatment is needed. Many styles of hearing aids fit in your ear with an earmold. Custom earmolds conform to the shape of your ears and ensure not only comfort, but also the best fit. Our audiologists produce these earmolds as well as custom earplugs and swim plugs. Earplugs help reduce exposure to noise levels that can damage your hearing (above 85 dB). These situations may include work, sports, concerts or hobbies such as snowmobiling. Some people find custom earplugs help them sleep better. Swim plugs prevent water from entering your ear canal and can help prevent infection. Today’s technology offers a wide range of accessories, including Bluetooth devices that can stream sound from the phone or television directly to hearing aids. Special microphones provide enhanced hearing from as far away as 30 feet, and personal FM systems use radio waves to deliver sound. Even if you don’t currently have hearing aids, many devices are available to improve hearing conversations, television or phone calls. If diagnostic testing indicates you will benefit from hearing aids, the licensed professionals at ENT Physicians, Inc. will assist you in choosing the best listening devices for your needs. Many styles, colors and options are available and may be custom-fit or available to wear immediately. 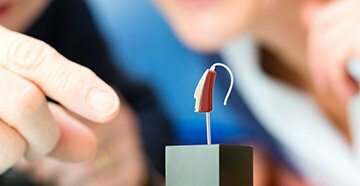 During your hearing aid fitting, the hearing specialist programs your devices and makes any necessary adjustments so the sound and fit are ideal. You will periodically return to either our Toledo or Oregon office for any adjustments. Minor repairs can be made in-office. More serious issues require returning the hearing aids to the manufacturer for repair. We can evaluate any damage and determine the best course of action. The inner ear is part of the vestibular system, pertaining to balance. Our professional team uses advanced testing and equipment to evaluate patients with dizziness, vertigo or balance problems. Protecting your hearing is important. Using custom hearing protection for hunting, swimming, musicians, and work noise can prevent hearing loss. 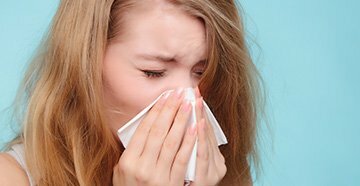 We offer custom solutions to meet every patients' needs.